I’ve been traveling the USA for the better part of two years talking about how to rev up Access with SQL Server, after hundreds of attendees, many miles traveled and more road meals than I care to remember, I finally got around to recording it. Here it is and PLEASE leave a comment below! Note: I’ll be presenting “Using Access as a BI tool for SQL Server” next Tuesday, August 7, 2012 at SQL Connections user meeting at Microsoft’s Office in Downers Grove in Illinois. You MUST register by Monday August 6th! Click here to register. Your presentation is excellent. I just suggested to my boss to upgrade to SQL Server from Access. The main reason why is because of security concerns with MS Access. I know the log-on information can be found in the connection string and if a hacker can copy/paste the entire backend he can decompile it within minutes using programs found on the internet. Do you have any recommendations on how SQL Server can help us with security?. Also, how about SQL Azure? is it comparable in terms of reliability, or do you prefer using the on premise version of SQL Server? I work for the Electronic Data Interchange department and one of main jobs is data transit. I wanted to use SSIS and SQL Agent. Do you have that kind of information in your blogs? Any suggestion is absolutely appreciated. Horrified Microsoft has dropped support for Access Data Projects in Access 2013. The work involved to switch backed to Linked Tables is a nightmare. Try converting hundreds of views to pass-through queries manually. What I did do was to script all the views using SQL Server Express Studio Management. I then opened the script in Notepad++ where I used Search and Replace to remove all unneeded text. I then copied the remaining data into a Excel spreadsheet. I use Excel to split the data into View Name and View SQL columns. I then imported the Excel data into a local Access table. I then used a custom function to loop through each row and create each pass-through query with connection details embedded. While I’ve yet to undertake any ADP migration project, I wonder if it’s actually simpler to just revise the form opening so that you bind an ADO recordset to the form instead – that way you don’t necessarily need to rewrite the queries and continue to use mainly same code that is ADO-based. Hi Juan, thank you very much for your terrific presentation! It was very helpful and comprehensive. 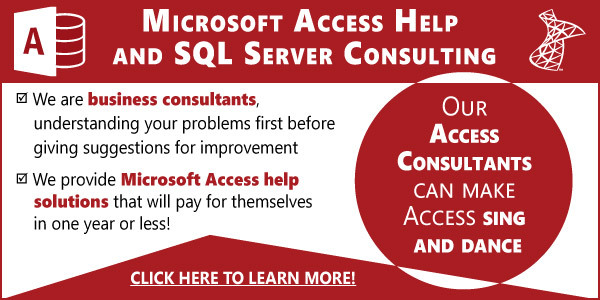 I have had a bit of experience on using Access with SQL Server (really just starting on this) and I was myself really impressed at the speed and advantages of such combination! I was really glad of having found your blog and having watched the video as it gave me a lot of pointers on how to improve my use of powerful sql server. Thanks again for your contribution to the Access world! Great to hear you liked it! On another note, we are hiring Access developers in Latin America, if you know of any please send them my way. Hi Juan, I can’t understand a few bits of your presentation, could you please tell me what you say at the times indicated below? I underlined what I don’t get and put between parentheses what to me is the most likely guess as to what you said. 8:54 Sometimes these local tables get replicated ________________ on SQL Server. That’s ok, they’re usually static and (not have) that many records. 8:54 Sometimes these local tables get replicated (mumbling, ignore) on SQL Server. That’s ok, they’re usually static and (not have) that many records. 12:53 now one of the drawbacks to using views as a data source to a form is that SQL Server may get confused as to which table you are trying to add, edit or delete, (this is only applicable in multi-table views). 17:55 You can also use a pass through query as a form’s record source but then users can’t edit the data so it’s not recommended. Great presentation. What would be interesting is to see how your cloud apps work in real life. I tried to do something myself but the data transfer was slower then it was from the local hard drive. It might be the server speed, but I would really like to see how you do it. I was running away from SQL until I found your blog. Now I only need a little push to take me over the edge. Glad to hear you are not running away anymore! There are many factors that influence speed, from the design of the tables to the connection properties. Make sure you follow are tips on designing tables and limiting data to just the record you need at the moment. I have a question (and thank you for all the blog entries, they are very helpful). I’m struggling with the understanding of where the work is done. Normally I would let a bound form take over the function of inserting and updating data (unless it was in bulk) but if I’m connected to SQL Server tables should I treat them like access tables and bind them to the forms for editing purposes or should I write something complicated and execute commands to sql server to edit the data, perhaps with a unbound form? Your question is why I decided to start this blog, there was not enough information out there on this topic and even some misconceptions. Load only one record per form if you can. Perform major operations on many records on the server using ADODB, not linked tables. Properly design tables in SQL Server to make them work with Access.